Home > Educational Classroom Kits and Activities > Tackling Science Kit: Air Takes Up Space! Tackling Science Kit: Air Takes Up Space! Enhance your current science curriculum with these innovative lesson supplements. Each kit of materials contains everything you need to tackle a variety of hands-on activities focusing on a specific subject of science study. Easily integrated into any program, these inquiry-based learning kits are ideal for science centers, enrichment, or take home explorations. 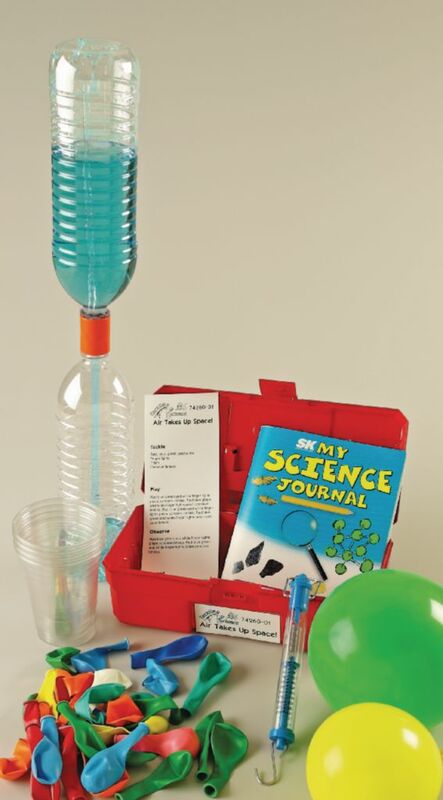 Developed by Teresa Harris Matherne, all Tackling Science Kits include a student science journal, reusuable laminated student guide, and all activity supplies packaged in a stackable tackle box. For grades 2-4. Students discover that air is matter too with mass and volume. One activity also explains how air makes a fountain work.